Diligent readers will recall this blog’s lament about the paucity of non-Americanized Chinese restaurants in the Inland Valley. My hope was that Chino Hills, with its proximity to Diamond Bar’s Asian population, might have something a bit more interesting. A friend recommended a place, and some Internet research turned up a second. We tried the second one — we’ll go back for the first — on Tuesday. That was Peking Deli, which is in a strip mall off the 71 Freeway at Pipeline. It’s a simple storefront operation with table service. Nothing fancy, but comfortable. We had pork fried rice cake ($5.25), dry noodle with Peking sauce and sesame sauce ($4.50) and beef with spicy sauce ($8.75). My friend liked the latter two best; I preferred the rice cake. It’s not like the diet-food rice cake but rather slices of soft, chewy rice that resemble bamboo shoots. All the customers but us were Asian, a good sign. 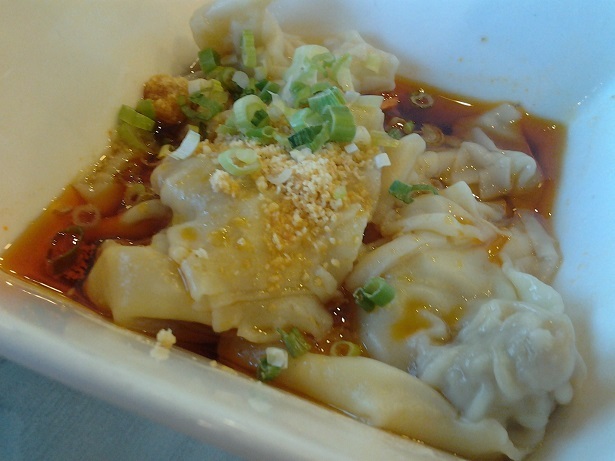 Peking Deli has been in business four years and survives on word of mouth, our server told us. But she was delighted to learn that the restaurant had been well-reviewed on Yelp.com. The only downside to the place is that it closes at 8:30. They didn’t kick us out, but within two minutes of our departure, the lights were out. I hope to go back sometime — after first sampling that other Chino Hills Chinese restaurant. * Update October 2014: Well, “that other Chino Hills Chinese place,” Good Time Cafe, has since closed, but Peking Deli is still in business. 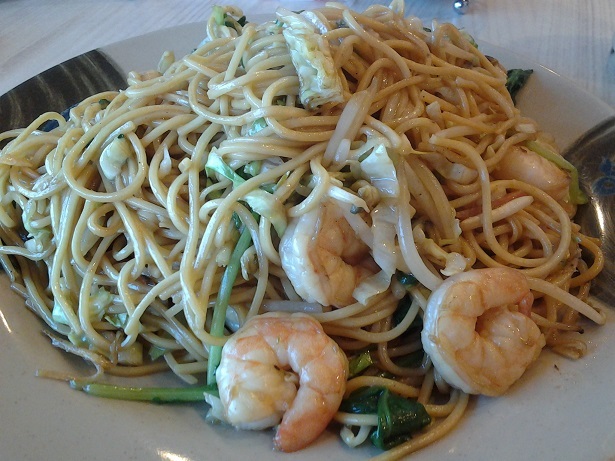 I returned recently for dinner, getting shrimp chow mein ($8), wonton in chili oil ($4) and a boba tea ($1.50). I had actually asked for No. 62, shredded pork with bean curd, but they brought me No. 26, the chow mein. Well, I like chow mein, so no harm done. (I didn’t want to waste food by sending it back.) I liked my dinner and took home enough for a second meal. 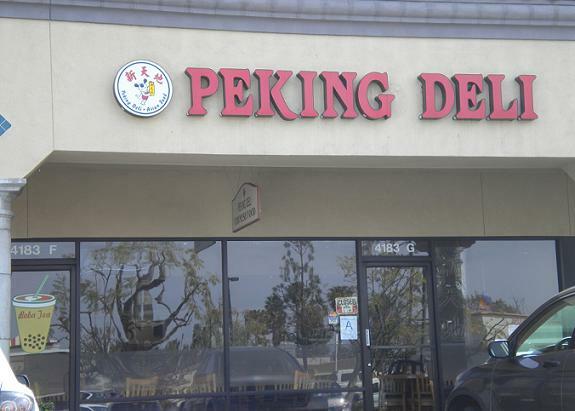 Peking Deli is still among the most authentic Chinese restaurants in the Inland Valley, one actual Chinese American people eat at. By 6:30 p.m. that Sunday, when I left, every table was in use. First thing that happened to me at Tuesday’s Chino Hills council meeting — after going through the metal detector, that is — was being greeted by spokeswoman Denise Cattern, who asked if I knew the city has a webcam on the construction of its new City Hall. I did not. But you can watch it here. Because we’re all pressed for time, I especially recommend clicking the “time lapse” button at the top, which allows you to see all the construction to date, including coffee breaks, take place in about six seconds. If Montclair is more your bag, you can view that city’s webcam, trained on construction of its eye-popping new police HQ, here. Both are about as exciting as watching paint dry, because that’s pretty much what you’re watching, but there they are. A line wrapped around Rhino Records on Sunday of people waiting to see singer-songwriter Kimya Dawson, whose songs were featured in the movie Juno. At the head of the line was a high school sophomore named Melanie, who brought a stuffed panda as a gift for Dawsons daughter, Panda. Melanie told me she discovered Dawson from Juno and instantly felt simpatico: Its like she pulled these songs from my brain. Its kind of creepy. The store was cleared of customers before some 400 fans, many of them under 30, were allowed inside for the free show. It was said to be the best-attended in-store performance in Rhino’s 34-year history. Most of the audience hung on Dawsons every utterance and seemed thrilled to be there. In a rarity for an in-store show, Dawson was onstage for a full 90 minutes, performing 18 tunes in her sing-song, stream-of-consciousness style. And thats even though she said she was suffering from a cold and got only an hours sleep the previous night because of attending the indie-film Spirit Awards ceremony. Her band members took over in the middle of the Rhino show, performing eight more songs, to give her a rest break. Strumming a guitar, Dawson sang songs from previous albums, the soundtrack and a just-recorded children’s album. Sorry if you just came today out of curiosity, and then theres all this, Dawson remarked toward the end. But all my shows are like this. On my way out I ran into an unexpected fan: developer Randall Lewis. He said hed enjoyed himself. Who knew he had such out-there taste? I dont think hes going to give Dawson a free house, though. “My main interest, however, is where these are available in the Inland Empire — more so around the surrounding Ontario airport areas. I know of a few that I patronize regularly. It’s a lot of good healthy food for an average price of $6. Most Japanese establishments have this available. Some in the fine dining category may not. “Kazama Sushi on Foothill in Upland had a bento box but they down-graded the contents and it was not the same. “If there are more I think Daily Bulletin readers would enjoy this and take advantage of these Bento Boxes for their lunches. Japanese food is not only about sushi but Bento Boxes too. “Also having lived in Orange County, I patronized places that offered these bento boxes daily. There are more of these venues in O.C. so it’s a common find. “I hope this can be considered as an article. If you know of the staff writer that can perhaps do this for the Daily Bulletin, please forward this email. I’m sure they would enjoy these bento box lunches as I do. I’ll leave it to the features staff whether to write an article about bento boxes, but at least your plea has been heard here at the blog. Anyone want to add to the list of bento box purveyors? Oh, and let me add that Kazama Sushi is now in Claremont’s Village Expansion, where it opened last week. Another sushi restaurant has taken its place at Grove and Foothill. 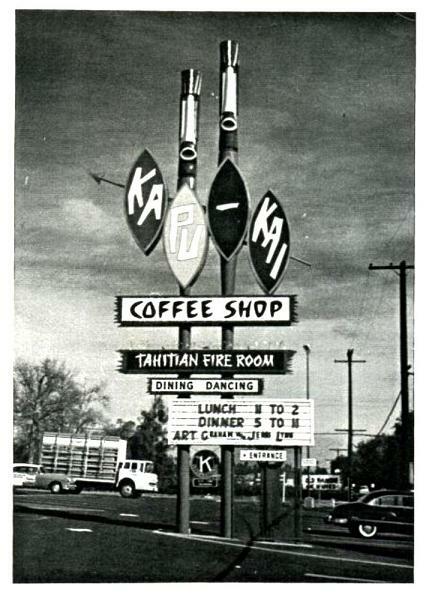 Among the Seven Wonders Past suggested by readers was the Kapu-Kai in Rancho Cucamonga. That corner is now famous for having two Starbucks outlets, one at the edge of the parking lot and a small one inside the Albertsons. [Every now and then it’s fun to do a column to appeal to the younger crowd and publicly renew my I’m-not-dead-yet credentials. It’s also fun to try to explain the topic to the generally older crowd reading me. Since this column, Erik Palma replaced Eric Milhouse as manager, the White Stripes returned, a Glass House Record Store opened next door and a Glass House bar, which has been under construction for two years, seems to be taking shape. Oh, and the Goddess Pomona was dropped from the county seal. Greetings! It’s a gala day here as “Pomona A to Z” gets the letter G in its greedy grasp. Which G meets my goal of showing Pomona’s greatness? * Goddess Pomona, the Roman deity of fruit, who is not only the city’s icon but the dominant image in Los Angeles County’s official seal. * Ganesha Park, one of the valley’s most gracious green spaces, nestled amid the picturesque Ganesha Hills. * Garey, Gibbs and Gordon, three downtown streets named for investors who built Pomona. Good stuff! Yet our G, as you might guess, is another G entirely: The Glass House. There’s no sign outside and the 84 feet of windows along West Second Street reveals what looks like a vacant storefront. Yet young people of all shapes, sizes and hair colors line up around the block to get in when the Glass House has a show. The low-key concert venue manages to attract top-flight alternative-rock acts to good ol’ Pomona. It started with No Doubt, which opened the club with a two-night stand on Jan. 25 and 26, 1996. Among the performers since then: Sonic Youth, the White Stripes, Beck, Weezer, Tricky, the Hives, Sleater-Kinney and the Pixies. That’s right, the Pixies! Wow! NOTE TO BAFFLED READERS: If these names mean nothing to you, don’t panic. You’re not old and out of touch! Are you kidding? Music was way better in your era (“your era” being anywhere from the 1930s to the mid-1990s). Yes, yes, it’s all a bunch of noise today, ever since the jitterbug. I understand. Forget I brought it up. Many bands play one show in an L.A. club and also play a night at the Glass House, which draws “all the kids from Riverside and Orange County” who can’t get to L.A., Glass House manager Eric Milhouse told me. Brothers Perry and Paul Tollett co-founded the club to fill the void left by the demise of the Pomona Valley Auditorium and Montclair’s Green Door as live music venues. How does the 800-capacity Glass House out in the hinterlands of Pomona get such good bands? “Usually we get bands on the cusp of becoming successful,” said Glass House employee Erik Palma, who handles contracts. Then again, Sonic Youth, a veteran band of more than two decades that came to Pomona in July, “wanted to play (here). They knew about the Glass House,” Milhouse said. Longtime residents will remember the building as a Thrifty Drugs, which operated from 1949 to the 1970s. Some remember the old layout. Seriously, if you can look past the tattoos and piercings, the Glass House is a pretty safe environment. Unlike many clubs, all ages are allowed because no alcohol is served. Security guards are watchful. “Our average age is 14, 15,” Milhouse said. Parents can come in for free to inspect the place. “It’s kind of a neat thing to do all-ages shows. It’s such a good outlet for kids,” said Milhouse, 28, an earnest, soft-spoken music fan who grew up in Riverside. But what the Glass House lacks in comfort, it makes up for in value. Tickets average $12, parking is free and Cokes are $2. I saw up-and-comers the Shins, whose music is featured in the movie “Garden State,” for $19. Try getting that deal at Staples. One memorable recent show was an April date by the Pixies. Set to play Coachella, the newly reunited band did a surprise show in Pomona the night before. “You saw Jack Black and Zach de la Rocha singing along to every word, as into it as the kids,” Palma said. To attend the 2002 MTV Music Awards in L.A. and their Glass House show later that night, the White Stripes had to be creative. Some people are rain partisans. Me, I prefer rain that falls gently at night, while I’m sleeping, before giving way to sunny skies at dawn. Not light rain and gray skies, day after day. This overcast week, life here is like Seattle but without the coffee and monorail, San Francisco without the charm, Portland without Powell’s Books and trolleys. Good weather is all we have. Without it, what are we? Bah. Both restaurants in a yellow strip center at Third Avenue (I think — the street signs are missing) notable for a Green Burrito, Digital Color World and Check ‘n Go. At lunch Tuesday I entered Sho Sushi and took a seat at the sushi bar. I had most of my usual sushi items: salmon skin cut rolls, spicy tuna cut rolls, salmon sushi and albacore sushi. I’m inexpert at these things but would judge the sushi to be average — not excellent but not bad. Sho seems to be known for “all you can eat.” I simply ordered my items off the menu and when the bill came, it was “all you can eat,” $19.95. Mentally adding up what I’d ordered, it came to slightly more than that, about $23, so I guess it worked to my advantage, barely. Sho Sushi, by the way, used to be owned by the people who now own King’s Teriyaki on East Holt in Pomona, where I wrote about getting napkins imprinted with the Sho Sushi logo. The interior has a black-and-white motif with Route 66 and car-related decor. I got the Maserati, which is an Italian Trio sub (ham, mortadella and capicolla, I believe), 8-inch size, plus macaroni salad and a Coke, for $9.42. The sub was fine and filling, the salad pleasingly peppery. They gave me a sub card — a free sub on your eighth visit — and you can sign up for e-mail coupons that will also net you a free meal on your birthday. I’m not a sub guy, and when I am I go to Grinder Haven, but this was a nice little place. On my way out, after almost an hour of eating and reading, the guy behind the counter, who had taken my name with my order, called out, “‘Bye, David.” So he gets points for trying, and maybe I will go back sometime. Where are the 24-hour restaurants of the Inland Valley? Most seem to be in Pomona. * La Fuente, 987 S. Garey Ave. at 10th Street. * Grandma’s Donuts, East Mission Boulevard just east of Garey (can’t find them online or in phone book). * Golden Wok, 1725 N. Garey Ave.
* Taqueria de Anda, 1690 S. Garey at Franklin. So Pomona has a lot of night owls. What about the rest of the valley? * Rancho Cucamonga has Corky’s Kitchen and Bakery, 6403 N. Haven Ave. just above the 210. Apparently they do good business in the middle of the night. The fresh-baked pie is awesome. * Ontario has Fork in the Road, 4265 E. Guasti Road, at the Travel Centers of America West truck stop. The food is surprisingly good. Fork was featured in a segment of the Food Network’s “Road Food” in 2006. Surely there are more 24-hour joints, especially in Ontario. Anyone want to fill in the blanks, or tell stories about 24-hour dining? I bought two plastic shower curtains on Sunday, one to use in the obvious place, the second to protect the non-tile, painted wall within the shower. Yes, I’m a thoughtful tenant, one willing to shower within a cocoon to preserve my owners’ investment. In any event, replacing my curtains meant perching on the edge of the tub and unhooking a couple of dozen rings, gathering up the old curtains and tossing them, then resuming my perch, punching through the holes in the curtains and hooking them up to all those rings. Pop pop pop pop. Tedious work, but it’s nice to have my mildewed old curtains gone. The problem now is that my bathroom, and in fact half my house, now smells like fresh plastic. I love the smells of napalm and plastic in the morning.